Founded in 1789, the United States Marshals Service (USMS) is the nation's oldest federal law enforcement agency, yet many people – even some in Congress – are unaware of what the agency actually does. Director John Clark, who was appointed in 2006, has made it a priority to change that by both increasing and broadening communications efforts. Clark, a 25-year USMS veteran, made the offices of public affairs and congressional affairs part of the executive staff. Jeff Carter, chief of public affairs, and Doug Disrud, chief of congressional affairs, were both hired this year. Both report through the chief of staff to the deputy director. USMS has many missions, including apprehending federal fugitives, protecting federal judges and courts, seizing property, transporting and managing prisoners, and operating the witness protection program. Besides the public, the media, and Congress, the agency also communicates with other federal, state, and local law enforcement agencies. Carter notes that broad jurisdiction allows USMS to partner with a variety of agencies. Because those entities have a good understanding of the marshals, they're an important audience that can help raise awareness among the public and the media. Carter says the agency has adopted “a communications policy that empowers employees” to talk about what they do. Carter and Disrud each have six full-time staffers, and about 200 other field employees have been trained on how to engage with the media. Communications team members each have “accounts” that correspond with mission areas and headquarters divisions (such as judicial security and HR). Carter says this allows employees to develop expertise that helps them better serve the agency and inform audiences. 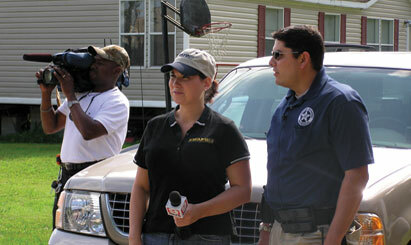 Ride-alongs with marshals have been effective in educating both Congressional staffers and reporters. Disrud says the experience tends to create “instant support” among Congressional staffers. Clark wants the public and the press to more widely use the USMS Web site, which he says is continuing to evolve. Carter is exploring ways to use new media as well, looking into which audiences might be engaged and what types of blogs are covering the agency. The president appoints the director, deputy director, and 94 marshals, so the new administration could mean a lot of turnover. Disrud also chairs a team that is working to educate and aid the incoming administration and senators, who will make marshal recommendations.